Description: This tree is 60-80' tall, consisting of a long straight trunk, ascending to spreading branches, and an oblongoid crown. Trunk bark is gray to gray-brown and somewhat rough, consisting of elongated ridges with flattened tops and shallow furrows. 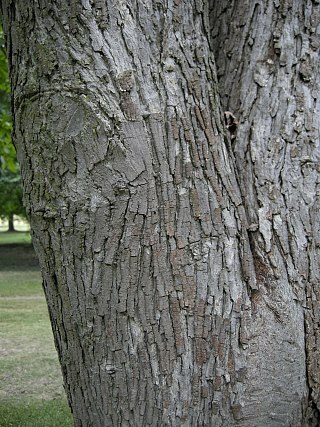 The bark of branches is more smooth and gray, while young twigs are brown and glabrous. Smaller branches and twigs are often crooked. Alternate compound leaves about 8-12" long develop along the twigs; they are odd-pinnate with 5 leaflets, and rarely with 7 leaflets (see Photo of Leaves). Individual leaflets are 2½-5" long and 1-2" across; the terminal and upper lateral leaflets are larger in size than the lower lateral leaflets. The leaflets are lanceolate to elliptic in shape and finely serrated along their margins. The upper surface of the leaflets is medium green and glabrous, while the lower surface is pale to medium green and glabrous. The lateral leaflets are sessile or nearly so, while the terminal leaflet has a short petiolule (basal stalklet) about ¼" long. The petiole and rachis (central stalk) of each leaflet is light green and generally glabrous; however, sometimes the base of the petiole is slightly hairy. Pignut Hickory is monoecious with male (staminate) and female (pistillate) florets on the same tree. The female florets develop at the tips of young shoots in short spikes of 2-5. Each female floret is very small (1/8" long or less) and inconspicuous, consisting of a green pistil and a few lanceolate bracts. Numerous male florets develop on drooping catkins about 2-4" long; the catkins are greenish yellow and narrowly cylindrical in shape. The catkins are arranged in bunches of 3 from short spurs near the tips of young twigs. Each male floret is very small (1/8" long or less), consisting of a calyx with several stamens that is partially covered by a bract with 3 lobes. The blooming period occurs from mid- to late spring for about 2 weeks. The florets are wind-pollinated. During the summer, fertile female florets develop into fruits (nuts with thin husks). Individual fruits are about 1" long and ¾" across and globoid-ovoid in shape. The husks are smooth and hairless across the surface; they are initially green, but later turn brown. At maturity, each husk partially divides into 4 segments to release its nut. The tan shell of the nut is ovoid and slightly flattened in shape; the meat of the nut varies from bitter to sweet. The root system has a long taproot and less well-developed lateral roots. Pignut Hickory is somewhat variable and different varieties have been described in the past; the preceding description applies to the typical variety of this tree. Cultivation: In Illinois, this tree prefers full or partial sunlight and mesic to dry conditions. It adapts to various kinds of soil, including those containing loam, clay-loam, sandy loam, or rocky material. Range & Habitat: Pignut Hickory is a native tree that is occasional to locally common in southern and central Illinois, becoming uncommon or absent in the northern section of the state. Habitats include upland woodlands, rocky wooded slopes, bluffs, upland savannas, and limestone glades. These habitats are typically dominated by oaks, or a combination of hickories and oaks. Pignut Hickory also occurs in woodlands that are more moist, but this is less typical. Faunal Associations: Various insects feed on various parts of Pignut Hickory and other hickories. These insect feeders include the caterpillars of the butterflies Satyrium calanus falacer (Banded Hairstreak) and Satyrium caryaevorum (Hickory Hairstreak), the caterpillars of many moths (see Moth Table), the larvae of many long-horned beetles (see Long-Horned Beetle Table), the leaf beetles Cryptocephalus guttulatus and Xanthonia striata, the lace bug Physatocheila plexus, several aphids (Monellia caryae, Monelliopsis spp., Protopterocallis fumipennella, & Tuberculatus punctatellus), several treehoppers (Carynota mera, Microcentrus caryae, Stictocephala palmeri, & Telamona unicolor), and many leafhoppers (mainly Eratoneura spp.). The leafhoppers Eratoneura anseri, Eratoneura bigemina, Eratoneura parvipes, Eratoneura teres, and Eratoneura turgida have been found on Pignut Hickory specifically; this tree is the preferred host of the last two species. These various insects attract insectivorus songbirds. The nuts are an important source of food for such mammals as the Red Squirrel, Gray Squirrel, Fox Squirrel, Southern Flying Squirrel, and Eastern Chipmunk; they are also eaten by the Gray Fox, Raccoon, Black Bear, and White-Footed Mouse. Hickory nuts are eaten occasionally by various birds, including the Ring-Necked Pheasant, Bobwhite, Wild Turkey, Crow, Red-Bellied Woodpecker, White-Breasted Nuthatch, and Rose-Breasted Grosbeak. Comments: Pignut Hickory is a reasonably attractive tree that should be cultivated more often than it is. This rather variable tree has been divided into different varieties and/or species (depending on the authority), which can make identification difficult. It is also known to hybridize occasionally with some species of hickory. Trees that produce unusually large fruits (about 1½-2" long) have been described as variety Carya glabra megacarpa. A similar species, Carya ovalis (Sweet Pignut Hickory), usually has 7 leaflets per compound leaf and a fruit that divides into 4 segments all the way to the base. It also differs from Pignut Hickory by having slightly shaggy bark (curling away from the trunk in strips) on older trees. 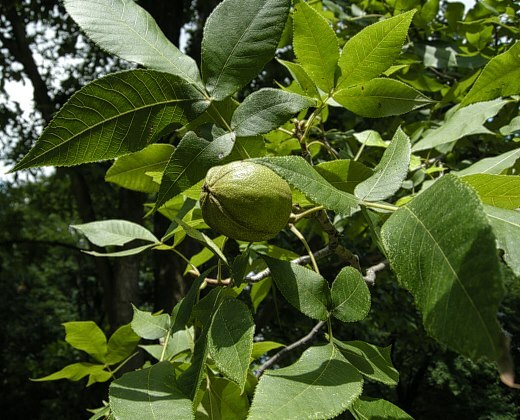 It has been proposed in the past that Sweet Pignut Hickory may be a naturally occurring hybrid of Carya glabra (Pignut Hickory) and Carya ovata (Shagbark Hickory).